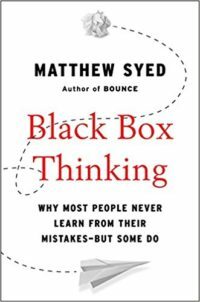 SYNOPSIS: A fascinating account of how cognitive biases and fixed mindsets cause individuals and institutions to fail to learn from their mistakes (and what to do about it) – by athlete and author, Matthew Syed. NOTE: Our attitude to failure is at the heart of progress, creativity and resilience. Why? Because the improvements that sustain them are rooted in the learnings of many small failures. And it’s these compounding marginal gains that lead to high performance in every aspect of life. And yet most of us suffer from habits that subvert our ability to learn. We blame others. We ignore uncomfortable evidence. We justify and explain. We succumb to biases that at best distort information and at worst intentionally obscure it. And these biases aren’t isolated, they’re everywhere. They’re in our schools and our charities. They’re in our homes and our offices. They’re in our newsrooms and our courtrooms and our hospitals. And they’re not harmless. They affect our outcomes and our freedom and even our life-expectancies. They handicap the very viability of our species. But with so much at stake, how have we failed to tackle these blindspots? How can we redefine and de-stigmatise failure? Or build more objective habits of testing and thinking and learning? Or replace cultures of fear and blame with progressive, open and non-judgemental attitudes? These are the questions Matthew Syed tackles in Black Box Thinking. Questions illustrated with insights from healthcare, aviation, sports, science, education, justice and entrepreneurship. Fixed mindsets – the perception of abilities as fixed and of failures as criticisms of competence and character. Failures of cognition are, in fact, failures of perception. We fail to learn because we fail to gather or correctly interpret the data that might help us. There are many different kinds of cognitive bias. Check out this Wikipedia article, Kahneman’s Thinking Fast and Slow or this great article from Farnam Street Blog for more detail. Failures of mindset are failures of acceptance. We fail to learn because we reject information, even when what we know to be true. Our self-worth cannot handle the consequences of failure. This need for ego-preservation is so strong that we will even sabotage ourselves to create ready-made alibis for failure. Both of these causes create “closed-loop systems”. They destroy openness. They miss, misinterpret or obscure information needed to learn. Syed’s solution? Only re-education and reframing can unlock the kind of consistent, effective learning that leads to high-performance. Overcoming cognitive biases begins with re-education. Once we understand and acknowledge the weak points of the mind, we can address them. We must learn when to trust our intuition and when to suspect it. We must embrace scientific method in every part of our lives. We must use tools like Randomised Control Trials and statistical analysis to go beyond first impressions. We must encourage the creation of independent bodies and processes to analyse our mistakes and conclusions. Overcoming fixed mindsets begins with reframing. Abilities and performance need to be recognised (from a young age) as the organic, ever-variable constructs they are. Mistakes in every part of life must be reframed as miss-takes – as essential stepping stones to progress. Adopting this type of growth mindset is as powerful for individuals as it is for organisations. And it’s essential in enabling progressive risk-taking and learning. To encourage transparency, we must reward openness with legal and social support. To enable progress, we must share information so that everyone can benefit vicariously. Re-education and reframing create “open-loop systems” – where feedback is rationally acted upon and openly shared. Embracing failure allows us to break down big processes and to test and improve each component. It lets us fail fast and supports the grit and discipline to keep iterating and to see changes through. It creates a culture of intellectual honesty that unlocks both marginal gains and their benefits. Our attitude to failure is at the heart of progress, creativity and resilience. When we identify errors, when we acknowledge them and take action to prevent them in the future – that is when we learn from our mistakes. And effective learning – whether in our homes, offices and schools or our governments, courts, hospitals – doesn’t just have big implications for you and for me. No matter who you are, where you are or what keeps you busy – effective learning has big implications for us all.